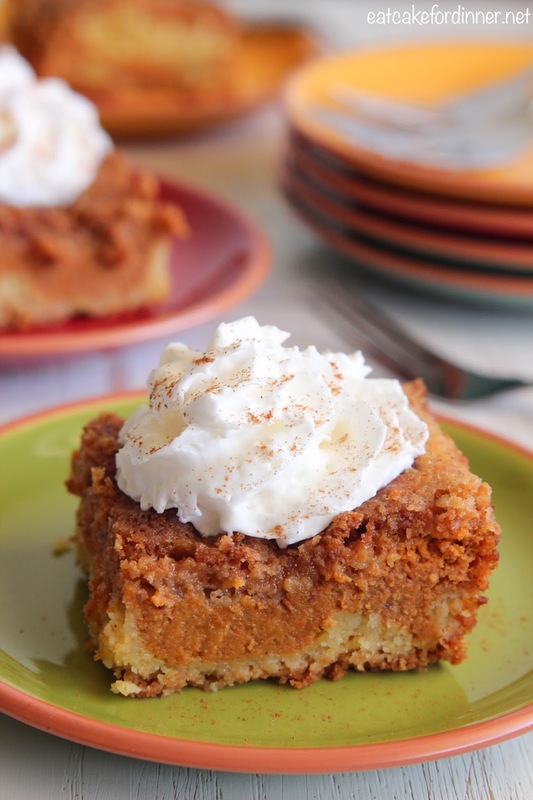 I originally shared this recipe on October 9, 2010, but since this Pumpkin Pie Cake is still my favorite pumpkin recipe, it's time to be shared with the world again. 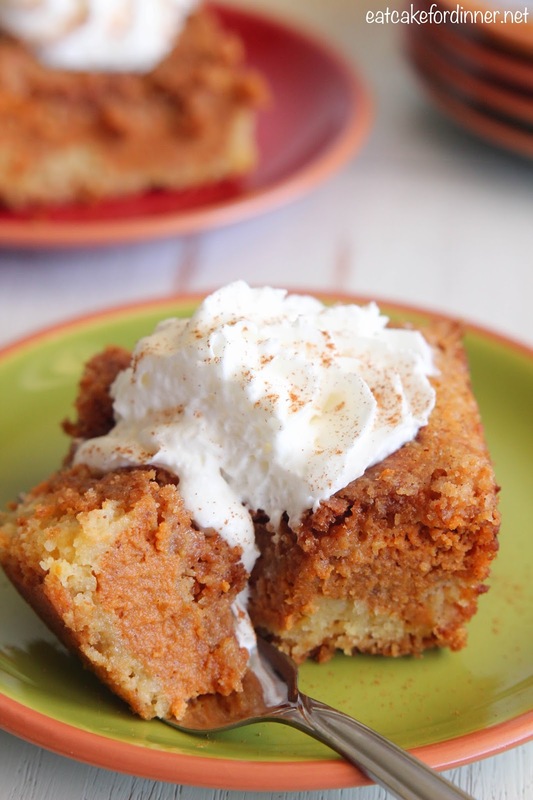 This cake is, by far, MY ALL-TIME FAVORITE PUMPKIN DESSERT EVER!!! There is just something about it that is so comforting. It has the perfect textures and combination of spices. Oh and don't forget the amazing streusel topping. I love sitting down on a cold day and eating a warm piece of this cake with a little Cool Whip on top. Pure heaven! I love to eat this cake warm, I just zap it in the microwave for 15 seconds or so, top with Cool Whip or whipping cream and enjoy. Reserve 1 cup cake mix; set aside. Combine remaining cake mix, 1 egg and 1/2 cup melted margarine. Spread into the bottom of a 9x13 pan. Mix canned milk, pumpkin, 2 eggs, 3/4 cup sugar, 1 tsp. cinnamon, ginger and cloves. Beat until fluffy. Pour over crust. Combine reserved cake mix, 1/2 cup sugar and 1 tsp. cinnamon. Cut in remaining 1/2 cup margarine until it is about the size of peas. Sprinkle topping over pumpkin filling. Bake at 350 degrees for one hour. Serve warm with Cool Whip or whipping cream. Oh...you are killing me with all this yumminess! I love it though! MUST add pecan pieces before you pour the melted butter over all!!!!! all the difference in the world! and NO OLEO...butter is best...I use the olive oil butter. And 3 t. pumpkin pie spice instead of the other stuff...it's heavenly with Cinnamon Cool Whip or REAL whip cream (preferably). Yes, this is a stable in our house during the holidays...so easy and so good. I have made this 3 times so far and every time I get so, SO many compliments on it!! Gotta try some of your other recipes. I am so glad you like it as much as I do! Thanks for letting me know. Yum!! I have all the ingredients on hand and will be making this later today!! Can you sub the butter for applesauce?? Think it would taste the same? I have not tried that, but I definitely think it would NOT work in this recipe. Applesauce works in some cake recipes when used in place of some of the oil, because it will still add moisture. In this cake recipe, the butter is needed to help create a crispy buttery streusel topping and nice crust.